It’s that time of year again – May 4th not only brings the eagerly awaited Star Wars Day celebrations, but also the anniversary of starting our blog! We’re celebrating a wonderful 2 years of geek chic fashion blogging this year, and what better way to enjoy it than with a geek fashion challenge! 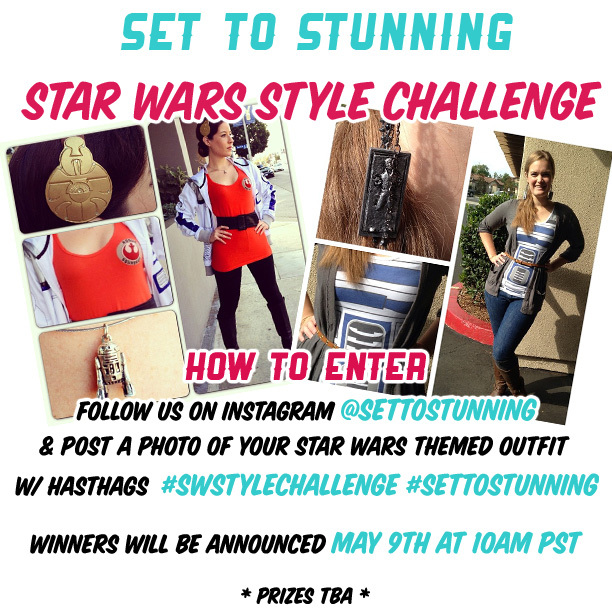 From 5/2 to 5/7, post your Star Wars inspired ensembles to Instagram with hashtags #SWStyleChallenge and #SetToStunning to be entered into our contest! And don’t forget to follow us on Instagram @settostunning. Prizes will be announced throughout next week. Happy stylin’, and May the 4th be with you!